Oh boy is it getting quite cold here in NYC. It is much easier to ignore the biting cold however, since the city is decked out in holiday happiness. Every corner you turn, there are twinkly lights, or if you are lucky Christmas tree-lined streets with that wonderful pine smell. 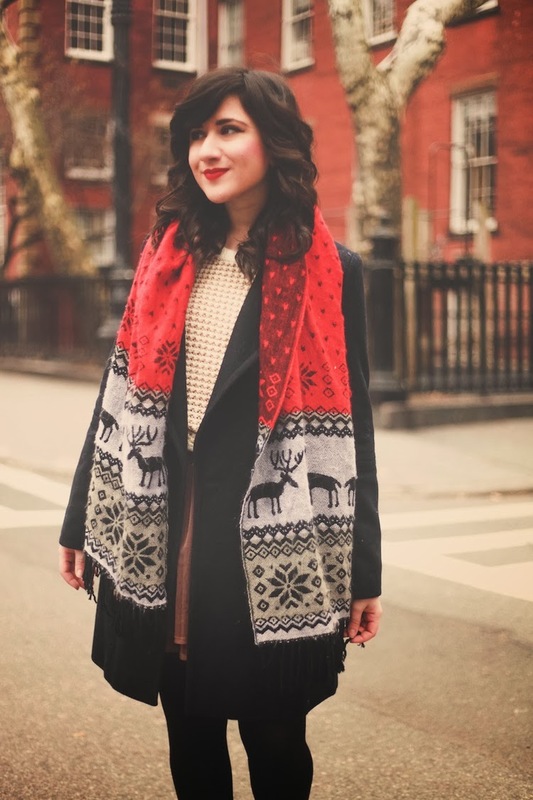 I am rocking all my holiday-inspired wardrobe while I can, like this reindeer scarf... so obsessed! Anyway, hope you all are having a lovely Friday, and enjoy your weekend! What a lovely outfit! :) Beautiful coat and scarf! Aw your scarf is just so cute and festive. You look adorable all bundled up. You look beautiful!! Here in Belgium it's starting to get colder too, but the festive spirit isn't around yet :( I hope it will come soon! Here it's getting colder too, but today we had a wonderful warm and sunny day and I was very lucky I could spent it outdoors with my dogs. 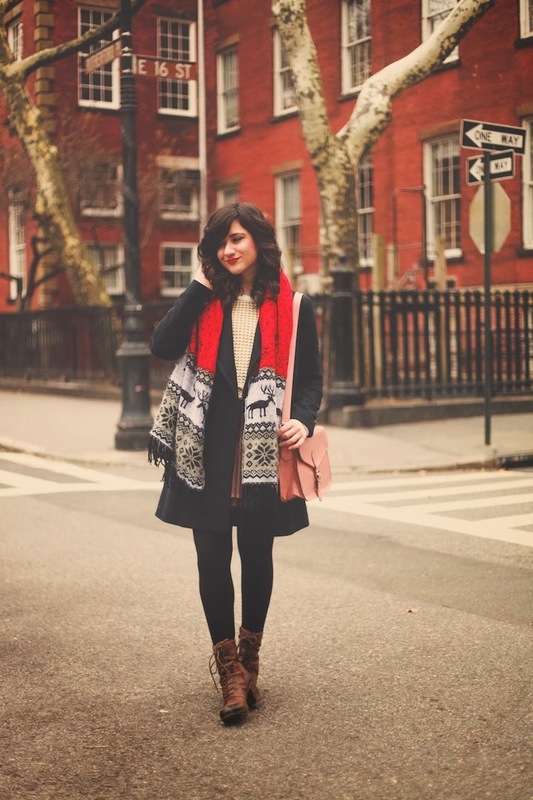 that scarf is so cute and festive! Stay warm! Love your new haircut, anyway! Looking so sweet as always! And you definitely look better in the new hairstyle. 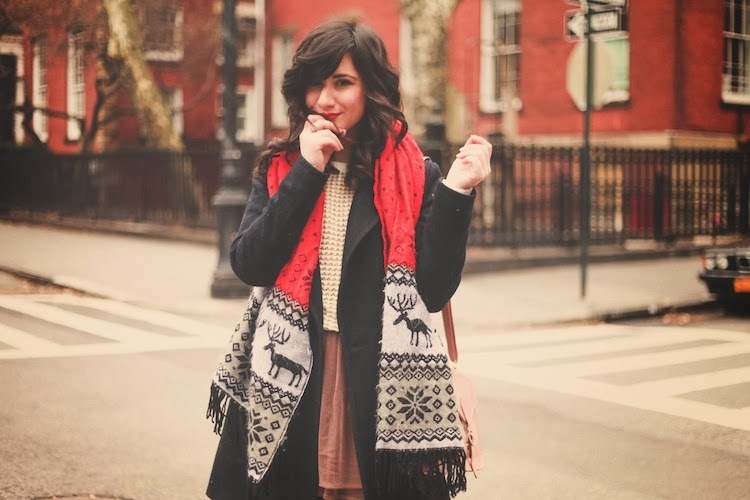 Drooling over the deer scarf! Love the layering! The scarf looks so cute!